The Irish and potatoes go together. There are many dishes where the potato is prominent, but this one is really a wonderful and easy one to make. It tastes great, is inexpensive, and is probably pretty nutritious. It is called Champ. It is really a side dish, but it can become a main dish depending on what you add to it. Most likely it would make a great side dish along with sausages (or "Bangers") or maybe a steak or a chop. (See my earlier article on Bangers and Mash.) It makes excellent Pub Food across the USA. To make it you just need Irish potatoes or baking potatoes or any type of potato you prefer. Then milk, butter, and salt and pepper. And most importantly you need lots of green onions (or scallions). You can also add the cheese of your choice. I made some by using the following items: baking potatoes, canned milk, cheese (Monterrey Jack and some Blue Cheese crumbles), salt and pepper, butter, and lots of green onions. As per usual, I do not give a precise recipe because I feel people can best make their own version just by giving the basic ingredients and basic plan. I simply cut up and boil my potatoes, with the skins on. I do not peel them. Drain and then mash the potatoes. Add milk, cheese, butter, and chopped green onions. Save some of the green onions to add to the top of the dish as a garnish. Mix everything up and serve hot. That is it. Simple and great. If you grill a sausage, a pork chop, or a hamburger steak and add a salad or a favorite vegetable, you will have a great meal. Some recipes might call for "scallions" instead of "green onions." These are similar items, but they might not be exactly the same. Some sources say green onions and scallions are the same thing by a different name. Other sources say "scallion" means a broader category of "onion" to which green onion is just one part. So, there is some debate on this fine point. But either one will do for our purposes. 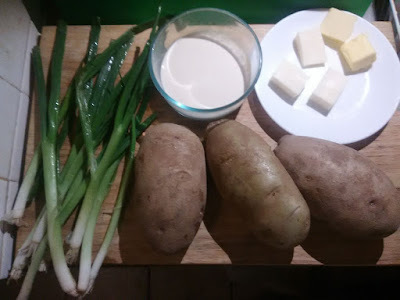 I am using lots of green onions because they are easy to find at my local grocery and are inexpensive. Plus, I like the taste of green onions and their bright green appearance. Bord Bia, the Irish Food Board from the Irish government, has a recipe for Bacon, cabbage, and Champ. "Bacon" for the Irish is similar to what we call in America, Canadian Bacon. But you could probably use ham too. 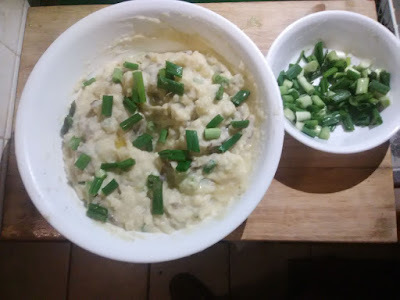 So, why not give Champ a try the next time you want a nice and easy Irish potato dish. Wikipedia article on Champ; Irish Food Board, Bord Bia for bacon, cabbage, and Champ.